Tough, yet compassionate -- and a first-class detective besides -- that's Boston Blackie. The infamous safe cracker turned private eye will lead you through sixteen hard-hitting crime classics from 1947-48! 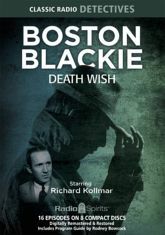 Richard Kollmar stars as Blackie, with Lesley Woods as Mary Wesley and Maurice Tarplin as Inspector Faraday. The race is on for our hero to capture the killers, recover the diamonds�and clear his own name!